This “out of box” dining concept A380 airplane restaurant is a fine dining experience at its best inside of a lavish airplane interior. As a hungry passenger you don’t need to go through a long line of check-ins or pay an air fare to get a fine airplane dining experience here. One of the locations of of this unique concept was opened in Chongqinig, China. 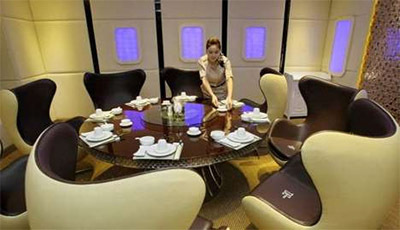 Interior of this restaurant is a replica of the of A380 airplane, the world’s largest passenger airliner that exists. 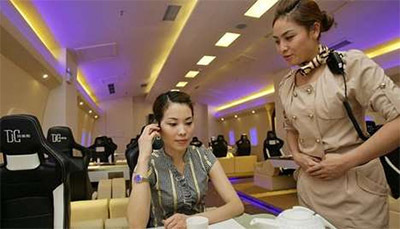 The restaurant staff is trained to resemble real airplane flight attendants. Usually a total of nine servers who talk, act and serve the same way. The restaurant’s interior includes A380 inspired windows, carpets, comfortable recliners seating, cabin lighting, a menu that looks a lot better than on a real flight and a lot of inviting LED light strips all around the cabin. The diner here is more than usual airplane food on the menu. 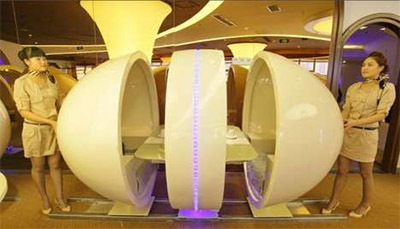 Another A380 jumbo themed restaurant is located in Taipei, Taiwan, which also resembles the inside of a plane, with baggage compartments, comfortable speckled blue seats with headrests and faux oval-shaped windows. 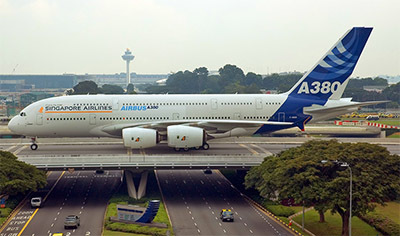 Below is an actual A380.